Annoyingly the way that the travel agent arranged our time means that we couldn't fit a trip into our time in cambodia; I wanted to go to Kratie where there are dolphins but it's a 6 hour drive each way and we don't have enough days and nights to fit it in. There didn't seem to be much to do in Pnomh Penh; the killing fields and S21 were obviously the main thing here so we had a fairly quiet day. 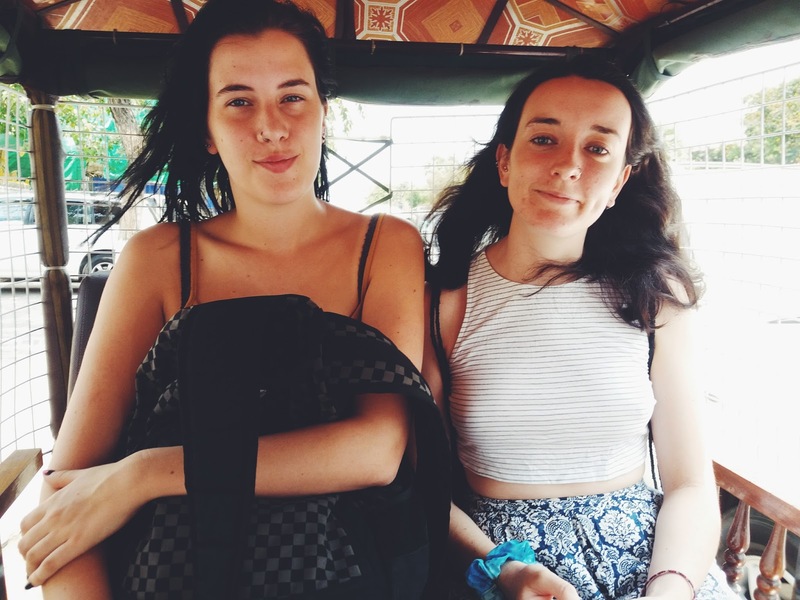 We had to go and pick up our bus tickets for Siam Reap from a hostel across town; we could face the walk as it's sooo hot so got a tuk tuk there in the morning. We had a confusing conversation as they didn't speak much English but managed to get our tickets, and set off back to our hostel in search of some food. Prices very considerably in the different countries we've visited, and some stuff is more expensive than others. Like in Thailand food and bottled water were really cheap whereas tuk tuks were fairly pricey, Laos was generally a bit more expensive but transport was cheap, Vietnam was just generally very cheap and Cambodia is surprisingly expensive; accomodation prices are fairly average but meals are $4 ish which is weird when we were paying less than £1 in Thailand and similar in Vietnam. Although the food at our hostel was nice enough we decided to venture further afield. I've been keen to try local produce but it's been difficult as the standard dish seems to be pork and rice and street vendors don't have menus. Luckily we found a nice restaurant where we had western food but it was cheap, nice and even included some vegetables for a change. We walked around for a bit and made our way to the central market. It's really difficult to stress how hot it is there; I feel like I'll read these posts back and wonder how we made what seems like a few small activities fill a day, but when your t shirt is stuck to you and you can feel sweet running down your back and chest the pace of doing anything rapidly decreases and usually involved spending a considerable time standing under any nearby fan. The market was impressive; it was so large that I was certain we'd come out the same way we'd come in but we're actually on the opposite size. It sold everything you could think of (aside from the sd card reader I need to get the photos off my camera, obviously); clothes, toys, toiletries, jewellery, fresh food. It was really interesting to walk round (dodging the fly coated fresh fish) and the others both got branded t shirts for a couple of dollars. I read something online that said that brands here are rarely take because there are so many of the factories locally that they're sent any rejected. Sadly I couldn't face carrying around any levis jeans as my rucksack is already overflowing. We headed back to our hostel without the aid of Google maps, quite impressive I think. We stayed in our room for a while and then lauren and i went downstairs and watched The Inbetweeners and ate chips. After showering, packing up our stuff etc we set off to a cinema I found out about online. 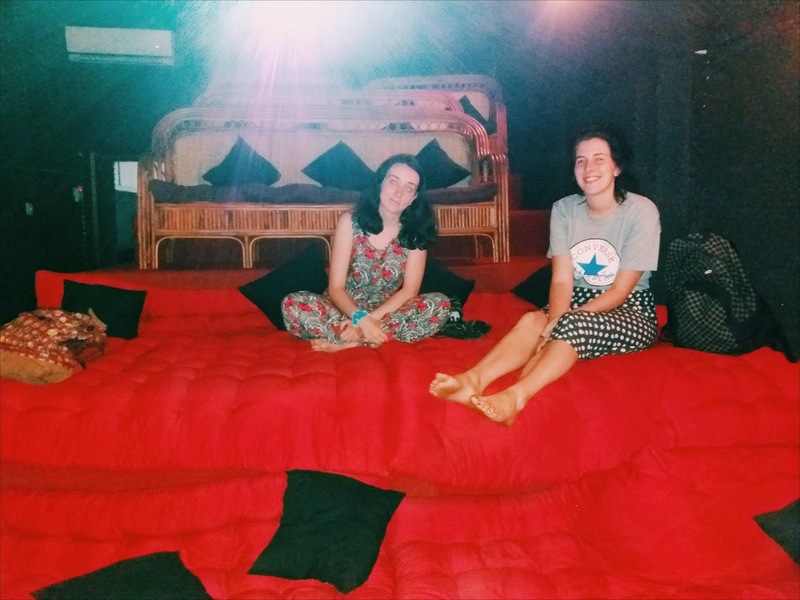 A tiny move theatre showing films in English with seats made of pillows so you can lie down. It was just around the corner from us and we made our way there. We paid $3.50 for a ticket which we used to watch 2 films and Molly and i got possibly the largest portion of popcorn ever for $2.50. The guy who served us was pretty rude though- he kept muttering 'seriously' when I tried to give him a lot of notes; sorry that it's clearly my fault the currency is so weird!! But apart from that it was pretty much perfect. We watched The Killing Fields first and it was just us and one other woman. It was by far the saddest film I've ever seen and i'd definitely recommend it to anyone who wants to learn more about the Khmer Rouge. Afterwards we saw a film called Sleeping With Other People- a light hearted rom com was definitely necessary after the first one. Afterwards we headed back to the hostel, packed up our stuff in preparation for tomorrow and went to bed.